In 1919, Congress passed the Eighteenth Amendment, ushering in the Prohibition era and forcing distilleries to move their business underground. Hidden up in the mountains—but close to large markets in Baltimore and Washington, DC—many so-called “moonshiners” turned to the Catoctin Mountain region of northern Maryland to reestablish their business. The most famous whiskey operation was Blue Blazes Still, site of one of the area’s most profitable enterprises during the Prohibition era until it was raided by police on July 31, 1929. 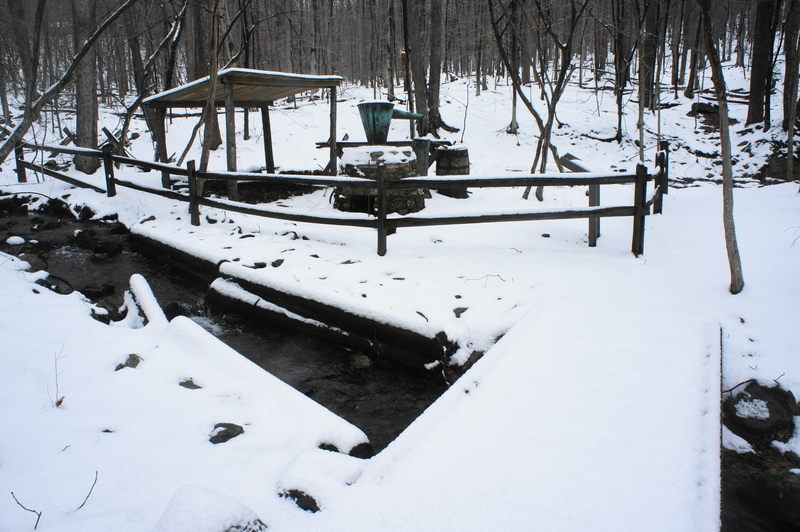 Nestled in the rugged landscape of today’s Catoctin Mountain Park, a short, 0.6-mile out-and-back trail provides passage along Blue Blazes Run to the former site of the still. While the structure at the site is a reconstruction, regular interpretive waysides tell the story of the rise—and dramatic fall—of the moonshine operation. 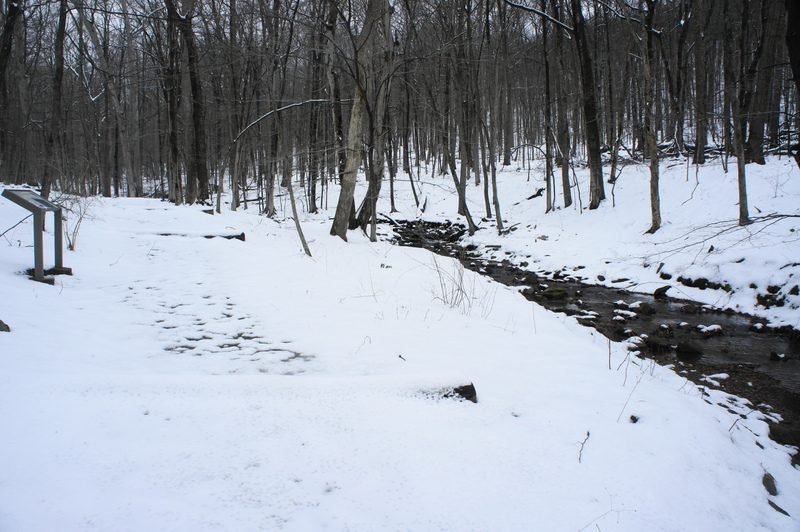 In Catoctin Mountain Park, hikers can start the short walk from either the overflow parking lot, just across the street from the park Visitor Center, or just up the paved Park Central Road on the left. This description follows the latter, as a marked path bears west from a spot across the road, just past the Visitor Center. Follow the wide path as it descends ever so gradually to a trail junction after about 50 yards. The longer Falls Trail continues straight to Cunningham Falls and beyond; the Blue Blazes Whiskey Trail heads right. Stroll along the relatively level trail as it hugs the right bank of Blue Blazes Run, situated amid thick woods at the base of a rocky ravine. The path climbs up and out of the gully at about 1/10 mile, meeting a paved maintenance road. Bear left on the road, crossing the stream, then look for a sign marking the continuation of the trail to the right. From here, the Blue Blazes Whiskey Trail pivots north again, this time along the left flank of Blue Blazes Run. Logs obstruct passage for wheelchairs, but the trail is otherwise level and easy to follow. 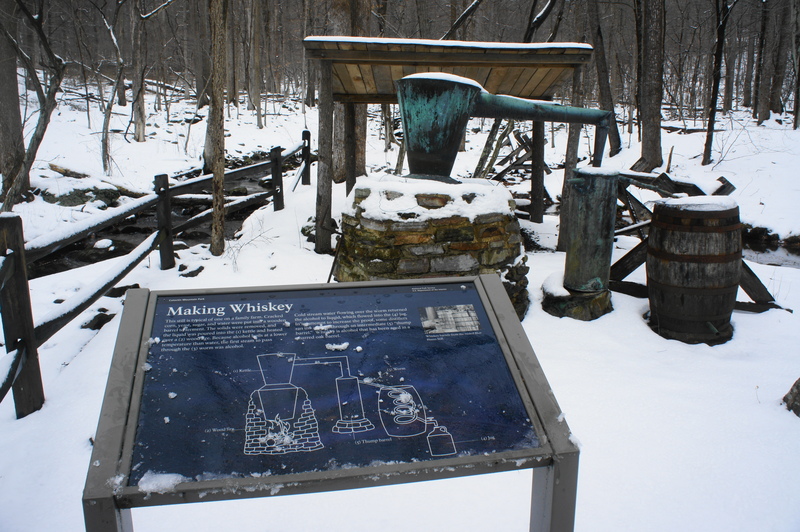 At 3/10 mile, the trail ends at a stream crossing and the reconstructed Blue Blazes Whiskey Still. Today, the distillery appears modest—effectively just a wood fire, kettle, and some barrels—much smaller than the large-scale commercial enterprise present here in the 1920s. The distilling business ended abruptly in July 1929 when a raiding party—led by Frederick sheriff Clyde Hauver—descended on the site. Although Hauver himself was shot dead during the raid, the local authorities got their revenge, eventually arresting the intrepid moonshiners and destroying the once-thriving whiskey still. From here, return the way you came, a short 3/10 mile walk back to the Visitor Center and parking area. This entry was posted in Easy Hikes, Maryland and tagged Blue Blazes Run, Blue Blazes Whiskey Still, Blue Blazes Whiskey Trail, Catoctin Mountain, Catoctin Mountain Park, historic, Maryland. Bookmark the permalink.